It has been a busy few weeks, what with a brief stay in hospital and a number of government consultations and conferences to prepare for and deliver. I finally found some time to get down to Cornwall and check out one of SUEZ’s longest standing contracts, the Cornwall PFI (public finance initiative) for residual waste treatment. The contract is made up of household waste recycling centres (HWRCs), transfer stations and the energy recovery centre which dates back to 2006. In this blog, I share a few of my thoughts and observations about the great work going on in the far south west, from innovative solutions and local materials handling difficulties to boosting the recovery of new target materials. As always, it was great to see SUEZ employees at the coal-face, working through issues and delivering quality at every turn. So after an early start in Maidenhead, Graham Mayes, Chief Operating Officer Development, and I headed south west, into some rather dark and heavy rain storms. It reminded me of many a summer holiday when I was younger, spending hours in the car, in less than ideal weather conditions with the hope of finding an abandoned beach and some summer sunshine. But, Cornwall has far more to offer than tourism, and the waste management sites and tours were as good as anything I had seen on my UK travels in recent months. The Bodmin MRF has been operational since 2003, previously it was a Cornwall Paper Company site, which SUEZ inherited in 2006 as part of the Cornwall contract, when five local authority trading companies came under one contract and transferred over to SUEZ. As part of the contract SUEZ is now running 13 HWRCs (more on these later) and two materials recycling facilities (MRFs) in Bodmin and Redruth, both of which handle approximately 30,000 tonnes a year of kerbside sorted recyclables. The Bodmin site is a busy one, receiving 80 tips a day, with 120 tonnes per day coming from Cornwall residential kerbside recycling collections. 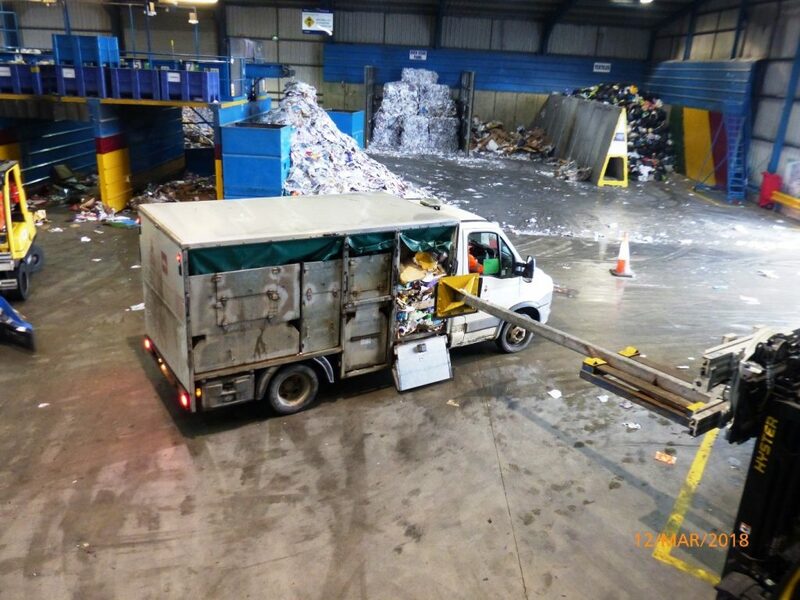 The materials that are collected are segregated at the source, meaning that each vehicle tips its different containers in different parts of the MRF, keeping the very clean paper separate from glass, mixed plastics and cans (which are then sorted on site). The site also handles some commercial recyclables from the region, this accounts for around 40% of the site’s capacity. Bodmin MRF is performing exceptionally well with 99% of materials that arrive on site going on to end markets, and average contamination rates of less than 1%. The site uses traditional MRF equipment, just like our larger sites at Landor Street in Birmingham and Avonmouth near Bristol, to ensure baled products are clean, and meet end-market specification. However, due to a high retention of site staff, and because many of the employees are local, the site rotates the teams from one part of the facility to another. This means all employees understand the quality on the plastics line, learn to differentiate the paper grades, and can work on the baling and export side of the facility. This not only gives all of the team a broader appreciation of how the site works, its design and its rationale, but also helps when holiday cover is needed. Everyone is very engaged, keen to share their experiences and ideas and were very committed to the delivery of a quality service and high quality products. Bodmin has a reputation for innovation, and for using the corporate systems and LEAN principles and adapts them to suit the local circumstances and needs, and this was evident when one of the stillage collection vehicles arrived. When the paper loads arrive they are not in a stillage container that can be lifted off by a forklift truck like other materials, meaning that the method of getting the paper of the vehicle require a lot of manual handling and increased health and safety risk. So, over the course of a few weeks the staff on site trialled a different method which is simple, but very effective – one of the forklift trucks has been modified to have a ram on the front that can lifted up and down and driven at the side of the vehicle to push the paper load off the vehicle and on to the tipping floor. As I said, simple but very effective and improving the sites efficiency, safety and performance! I was also very impressed with the visitor room at the site, which was used by schools and other groups as the key community engagement site in Cornwall until the energy recovery centre was opened in 2017. The site is still popular with local schools providing a very interactive and engaging introduction to all things waste, recycling and energy. Well done everyone, a really clean well run site, achieving great things in terms of recycling and consumer engagement and education – what a great start to the day! Next up was a 30 minute drive to the Connon Bridge Household Waste Recycling Centre (HWRC). The site has a closed landfill area and a transfer station which is currently undergoing significant refurbishment (new roof, cladding and odour suppression system) following a fire back in October 2017 (expected to be fully operational by May 2018). The transfer station was accepting 600 tonnes of residual waste per week from the region and sending it onto the energy recovery centre prior to the fire, which has meant other sites in the region are having to pick up the slack. Having been a former operational landfill site there has always been quite a vibrant and active community forum that meet frequently at the site. This has continued with the refurbishments to the transfer station and the development of the HWRC in recent years. Even though it was Monday lunchtime it was a quiet day at the HWRC, the site team explained that the data they collect shows there are obvious peaks and troughs in usage by the general public, enabling them to staff the site appropriately. The transfer station and HWRC will be operational as part of the contract with Cornwall Council until 2036, and as such there is always an opportunity or two to do things better, find alternative solutions and improve the system as a whole. As such the local team have been running a trial where they shred bulky waste on-site to avoid sending these materials to landfill, instead making it an acceptable specification for the energy recovery centre. They have also implemented a ‘Bin Guardian Programme’ at the site, where the public are greeted by a member of the team as they go up the steps to the residual bins (black bag waste) to see if the content is suitable for transport on to the recovery centre instead of being sent to landfill. Since January 2018, over 1,500 tonnes of black bag waste has been diverted and the scheme is looking to be adopted at other HWRCs in the county. The sites have also been looking closely at the opportunity to develop reuse shops, as we have successfully done in Devon (I plan to visit them in May) and Surrey – another great example of our teams and sites sharing their experiences and helping one another! The third and final stop of the day of sight-seeing was the Cornwall energy recovery centre near St Dennis. This is the heart of the contract, which opened in March 2017. The facility accepts 240,000 tonnes per annum of residual waste, some by direct delivery but the majority comes via our transfer station network across the county. CERC generates 24MW of energy (21MW is exported to the National Grid), whilst the incinerator bottom ash (IBA) goes to Ballast Phoenix next door for processing into aggregate products for road building and construction – as is the case at all our energy-from-waste facilities. Now I have seen quite a few of our energy recovery facilities, so I was interested in what was different in Cornwall. As the site was closed for planned maintenance during my visit, I managed to get a closer look at the roller grate, the furnace and the flue gas treatment than most visitors would. This site is designed and built by Vinci design (the only one in SUEZ portfolio) and has the unique addition of the aforementioned roller grate, which has turning (or rolling) grates that move the waste into the furnace. The site managers at all our energy recovery centres meet monthly to share insights, discuss operational processes and help prevent recurring issues that could have been foreseen based on the experiences at one site or another. The CERC i0s of great interest to this group because of its unique design. As with all our sites, the team were recruited early, prior to commissioning (some as far back as 2014) so the team could learn about the facility, work at other energy-from-waste facilities in our portfolio, and develop local standard operating procedures and protocols prior to the opening of CERC in 2017. There has been a huge investment in training to get the team prepared, and currently almost all of the staff at the site live within 10 miles of the facility. The bunker was almost full, dealing with the planned site shut down and had almost 8,000 tonnes of waste in store – which was quite a site! But the team were confident that line one which came online that day and line two which would be online in four days’ time would be sufficient to catch up before the bunker was at capacity and materials had to be directed to other disposal sites in the region. This shows just how ‘hands on’ the teams need to be, and how any slight delays to the maintenance programme could have significant operational and cost implications – so well done everyone! Just like the transfer station I visited earlier in the day the energy recovery centre has a vibrant community forum, who meet every few months to look at new opportunities and innovations and discuss any issues. My favourite innovation was hearing the team explain how the ‘breakfast club’ works – bringing the feedstock providers on site for a coffee and bacon roll to show them what target materials the site can handle and what the unwanted and bulky waste looks like. This has been critical to ensuring that there are no blockages and keeping the site operational and performing within its target parameters. As the day came to a close, I settled in to my bed for the night, at a lovely B&B, prepping for the contracts workshop I was helping to deliver the next day at CERC. Each site made me feel most welcome, taking time out of their busy schedules to show me every part of their operation, and highlighting things that they will be working on in the coming months – nothing stands still at these sites. Each site did a thorough induction, and as always I was most impressed by the calibre of the staff, from forklift drivers and bin guardians, to site supervisors and contract managers – they really do know their stuff and are proud to work for SUEZ and on behalf of Cornwall Council. What made this trip special, (and it wasn’t the sun coming out on day two!) is the obvious innovation and problem solving that has been going on at each site, and the willingness to cross-fertilise and share ideas with peers at other sites and contracts throughout the UK. It is always comforting to see that the management systems on all the sites were consistent, but not restrictive, and they have been localised to suit each site. Quality is at the heart of the SUEZ way of working, and these sites, the staff, and the systems are a clear indicator of that quality. I continue to be proud to be part of the SUEZ team and look forward to the next stage of my induction as I visit other sites and teams including a number of our collection contracts where I can see first-hand the issues at the kerbside, and our sites in Scotland operating under different policy and regulatory regimes. But for now it is back to a consultation response and a technical report that needs a review.